Personalised party wear range - Video help - My Party Wear! If you don't want to search through the site to see what we do, then why not sit back and let this 60 second video give you an overall view of what we can offer for your party, with our great range of personalised party wear. 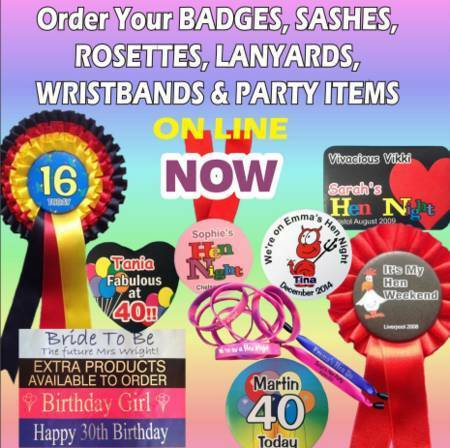 Whether its a customised badge, hand made rosette or custom printed sash then we can help to make your party the best it can be with our great selection of personalised party wear. Browse the site for other Personalised Party wear once you have watched the video overview. We have badge, sashes, rosettes and other items which we can personalise for your special events. Don't just settle for the standard items that are available in most gift shops. Spend a little more time, but not a lot more money and design your own items. Add all your own text and choose your own designs. If you don't see the design that you require then don't worry. Just give us a call or put your requirements in an email. We'll let you know what we can do to create your perfect design.